Schools in West Virginia are turning to a computer game to help fight obesity among students. Following a pilot project the video game Dance Dance Revolution will soon be installed in all the state's public schools. 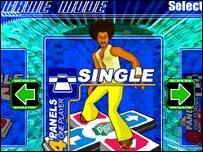 The game involves a player moving their feet on a special mat to copy dance steps shown on screen. Pupils aged 10-14 that do not like other sports will be able to take the game as an option for getting exercise. West Virginia has turned to computer games to make school children more active to help tackle its position as one of the top three US states ranked highest for obesity. The state also leads the US in rates of high blood pressure and is fourth in diabetes. 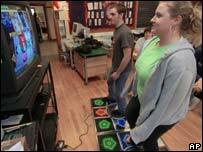 In early 2005 a pilot project in the state put Dance Dance Revolution (DDR) game machines in 20 public schools in. Following the success of that trial West Virginia is planning to roll out machines to 157 middle schools and eventually all 753 public schools. This means that the game will be available to almost 280,000 public schools students across the state. All the schools taking part will get a $740 (£414) bundle of kit that includes an Xbox game console, two dance pads and software. DDR maker Konami is contributing to the cost of the project and other funds are coming from state-based agencies. The final tranche of cash to fund the project is still being sought. West Virginia's education board is also developing a curriculum around the DDR machines to ensure they are used and will track the success of the project. The DDR machines are not designed to replace other physical education classes but are expected to be another option for children that want to become more active. Prof Linda Carson, who runs a project to study the health benefits of playing DDR at West Virginia University's School of Physical Education, said children aged 10 - 14 were being targeted because it was during those years that lifelong attitudes to exercise were formed. Some schools in California were the first to use DDR, but the West Virginian project is believed to be the largest of its type. Since its creation, DDR has become hugely successful and moved far beyond its origins in video game arcades. Now there are huge numbers of regular players, dance clubs and tournaments. Many people already use DDR to lose weight and some machines have a workout mode that makes copying the dance moves more like exercise. Are baby exercise classes the next big thing?